Free Printable February 2020 Calendar. 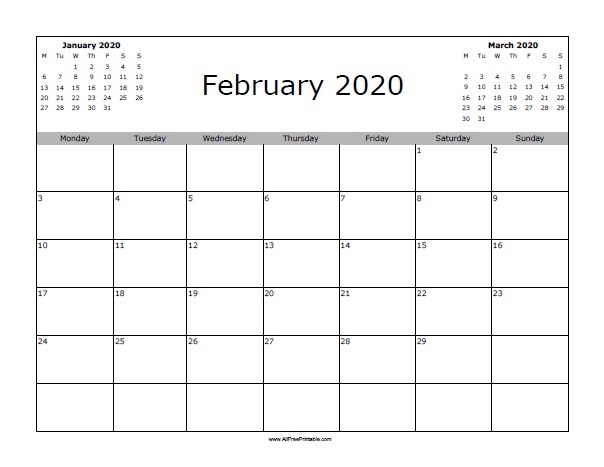 Free Printable February 2020 Calendar that can help you at school or workplace this month of February 2020. Write all the important things you need to do in February and attach where you can see it everyday. Print the calendar starting the week on Monday or Sunday. Write important things to do like Valentine’s Day romantic dinner, send a greetings card, vacation planner, buy chocolates for loved one, buy a gift, Valentine’s Day party, dates, don’t forget the flowers again, don’t forget anniversary and more. Use the link of your choice to download or print free.